Automotive repair jobs are expected to grow by roughly 17% annually until 2020. It’s a growing industry with a lot of demand. As the old saying goes, it’s a dirty job, but someone’s got to do it. And automotive mechanics sure do have a dirty job: dirty, but incredibly important. This is why many repair shops require their mechanics to wear coveralls (uniforms). Not only do these uniforms help keep the clothes underneath nice and clean (your mechanics and their significant others will thank you! ), but uniforms also help boost morale, improve customer service, further brand awareness, and much more! As a business owner or automotive mechanic, you know that grease, oil, dirt, and grime are just part of the job. It’s an expected occupational hazard. But that doesn’t mean you should just accept it. Instead, outfit your mechanics in uniforms. Not only will they look great, but their new uniforms will help protect their normal, everyday clothes. It’s a win-win for everyone involved: mechanics, business owners, and even your customers. Best of all, your uniform rental company will pick up your dirty uniforms, clean them, and deliver fresh uniforms right to your shop. What could be easier? Every team you have ever been a part of – whether in Little League, high school, college, or the working world – had one thing in common: uniforms. Now just think about how proud you were to wear that uniform. It was (and is) a source of great pride. That uniform made you feel like you were a part of a team, bringing you closer to your teammates. And happy teammates…happy workers…try harder. “It’s clear that creating a culture that supports employee well-being can increase workforce potential and drive organizations forward,” said Bright Horizons CEO David Lissy. ABC Auto Repair: You walk in the front door and notice the mechanics are all wearing street clothes. How qualified are these guys? Pass. GHI Auto Repair: All of the employees are wearing uniforms. They have some grease and oil on them, but have obviously been cleaned recently. This company cares about its appearance and its customers. Ding ding ding! We have a winner. People do not buy what you do, they buy who you are. In layman’s terms, people do business with brands they trust. Of course, you could go to the XYZ repair shop to have your oil changed and you could get great service, but you choose to go to Jiffy Lube instead. Why? Jiffy Lube is a brand you know and trust. And uniforms are a big part of the branding process. How you present yourself and your business is extremely important. Branding is how you set yourself apart from your competitor. By issuing uniforms to your employees that have embroidered or screen printed logos, you help to reinforce your brand by making it visible to the public. Lord Baltimore offers several solutions geared towards the automotive industry, including uniform rental (shirts, pants, coveralls, shop coats), mechanics hand cleaner, latex gloves, floor mats, microfiber towels, and more. 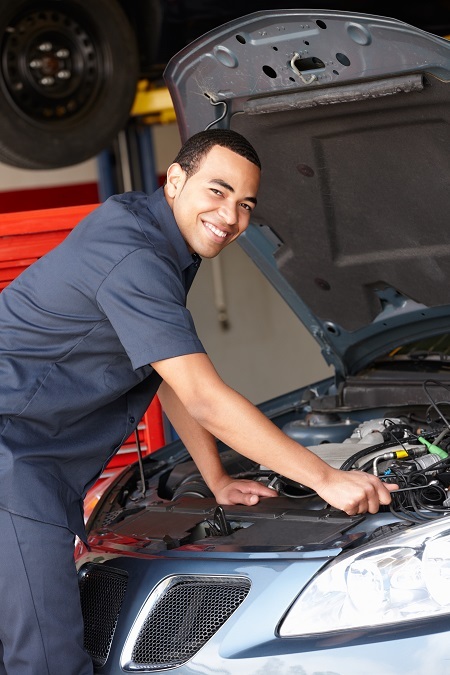 To find out if Automotive Mechanic Uniform Rental is right for your business, please contact Joe Bateman at 800-292-1224 or by visiting LordBaltimoreUniform.com. We also handle towel rental for gyms and salons; apron, towels, uniforms and mats for restaurants; and uniform, shop towel, fender cover and mat rental for manufacturing and automotive industries. This entry was posted on Thursday, November 6th, 2014	at 10:25 pm	. You can follow any responses to this entry through the RSS 2.0	feed. Both comments and pings are currently closed.